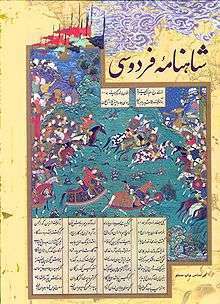 Faramarz-nama (Persian: فرامرزنامه‎‎) is a Persian epic recounting the adventures of the hero Faramarz who is the son of Rustam. The history book Tarikh-i Sistan (history of Sistan) mentions an account of Faramarz (akhbar-e Faramarz) in twelve volumes, but this work, which was likely in prose, has been lost. Instead, two Faramarz-namas (epic of Faramarz), both in the form of epic poems, are extant. The first manuscript, which appears to be older, is written by an anonymous poet who introduces himself as an admirer of Ferdowsi and is dated between the mid-11th and 12th centuries. In the manuscript he introduces himself as a villager from Piruzabad (or possibly an orthographical error in the text for Forsabad, a town near Marv in Khorasan). The poet states that he composed the Faramarz-nama at the age of thirty-six and his major source is a book by Azadsarv. Like other Persian writers of epic poetry who came after Ferdowsi, the author of this work was heavily influenced by the style of the Shahnameh. The second Faramaz-nama is a known book in 464 pages and containing between nine and ten thousand distichs. It was printed in Bombay in 1906 by the Zoroastrian scholar named Rostam, son of Bahrām Soruš of Taft, a contemporary of Moẓaffar-al-Dīn Shah (r. 1896-1907) who traveled to India to gather stories about Farāmarz. The plot is about the voyage of Faramarz to India in order to help the Indian king Nowshaad(Nowšād) Shah on the orders of the Iranian King Kay Kavus. Faramarz was ordered by Kay Kavus to help the Indian king Nowšād Shah. While there, he slays Konnās Dīv (a carrion-eating demon who had abducted the daughter of the Indian king), Karg-e Gūyā (a talking rhinoceros), Aždahā (q.v. ; a dragon), and thirty thousand rhinoceroses. He then leaves for the land of Jaypāl where he has to accomplish seven labors or tasks. (compare with Ferdowsi who in his Shahnama has also mentioned the seven labors of Rustam). The cycle of seven stages or labors is a model for heroic epics in Persian literature. The sixth labor of Faramarz is a debate with an Indian Brahman; upon its conclusion the Brahman abandons his belief in idols and becomes a worshipper of Yazdān. This concludes the Faramaz-Nama which finishes without an account of Faramarz's seventh labor or his journey to Jaypāl. His falling in love with the daughter of Fartur-tush, the king of the fairies, the disappearance of the girl in a spring, and his search for her. His accomplishment of the seven tasks to reach the kingdom of fairies. The seven tasks include the slaying a lion, a wolf, a rhinoceros, a dragon, and an ogre (ḡūl), and traveling through cold and hot climes. 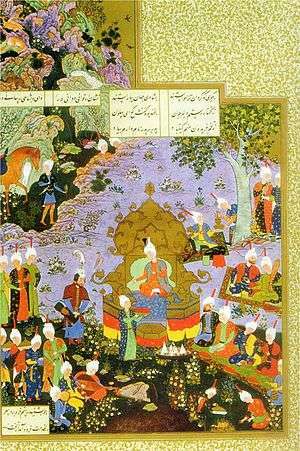 Farāmarz return to Iran where his wives give birth to two noble sons, Sām who is the daughter of the king of the fairies and Āḏar-Borzīn, whose mother is the daughter of the king of Kahīlā. The exploits of Sām are the subject of Khwaju Kermani's Sām-nāma (8th/14th century). 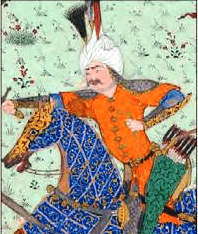 The adventures of Āḏar-Borzīnare are recounted in the last part of the Bahman-nama.